Sacred Putta Chiinarat Image in form of Pra Somdej Sacred Powder Amulet, with sprinkled Ploi Sek Maha Pokasap Gemstone Fragments, from the Great Luang Por Guay of Wat Kositaram (Chainat). 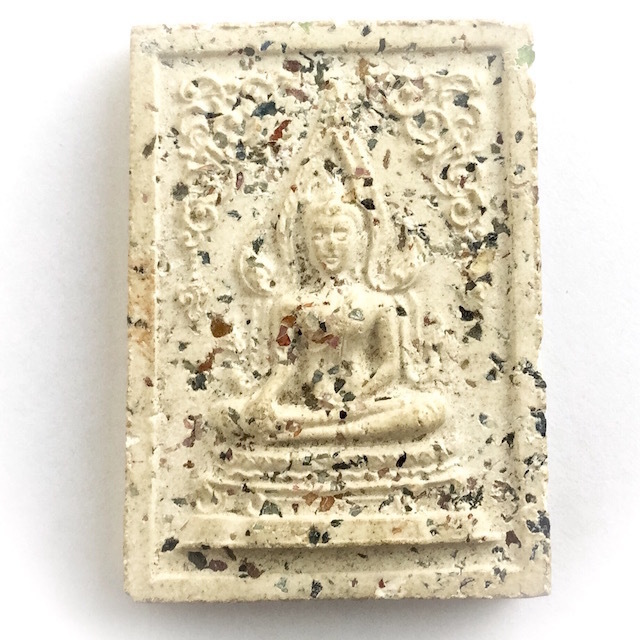 An extremely rare amulet that is now very highly sought after since the inclusion of this edition in the Tamniab Pantheon of amulets of Luang Por Guay, and its offical acceptance by the Samakom Pra Niyom amulet appreciation societies. The Pra Putta Chinarat is one of the 'Pra Koo Ban Koo Mueang' National Buddha Images, of which there are five official members. More than 4 Decades ago, Luang Por Guay made these Exquisite, and now Incredibly Rare lesser known Inner Circle Collector Pieces. In the year 2512 BE. He passed them on to the Abbot of Wat Racha Nadda, who empowered them even further with a host of great masters who passed through, and, in a final Putta Pisek Blessing with Pra Maha Gomaes inviting Luang Por Guay again to Preside over the final Putta Pisek Ceremony in 2515 BE. The amulet is filled with sprinkled fragments of precious and semi precious gemstones, which increases the Beauty, Monetary and (due to the empowerment of the gemstone fragments beforehand) also sacred value of this Ultra Rare and Classic Collector's Masterpiece. Luang Por Guay was also an Extremely Powerful Sak Yant Tattoo Master, who was highly reputed around the Kingdom, for Kong Grapan Chadtri and Klaew Klaad Maha Ud Power. The amulet features the Buddha Chinarat image, one of Thailand 5 most Sacred National Buddhas of Historical and Religious Importance, and revered for its power to save lives with Kong Grapan and Klaew Klaad power. The arch (Sum) is contained well within the edges of the oblong pressed amulet outer frame. The second tier from bottom on the dais, is a 'Thaan Singh' (lion pedestal), notable by its outer edge decoration, reminiscent of a pair of curtains, or baroque interior design. This double sided Pim is the Rarest of all Pim, and thus a Pim Niyom Category Showpiece. His amulets are now extremely rare to find because those who already own any will never wish to part with them again, and they are hence becoming one of the rarest kind of amulets to find these days. Usually this happens because of speculation by the collector scene, but in the case of Luang Por Guay's amulets, it has happened primarily for their Sacred Value, much much more than for their collectorship and artistic value, which is of course also extremely high. 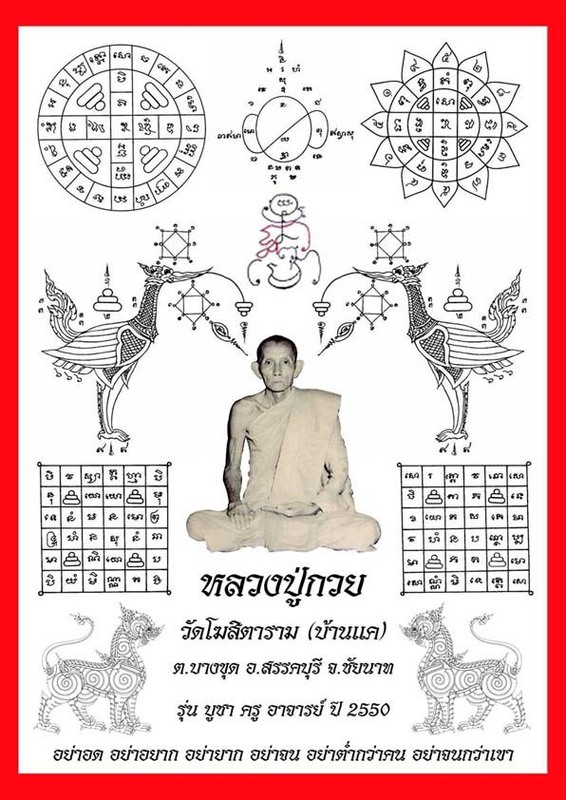 Luang Por Guay is famous for his immensely diligent and complex manner of empowering (Pluk Sek) amulets, which involved daily empowerments at various times of day namely at dawn, morning, midday, afternoon, evening and midnight. 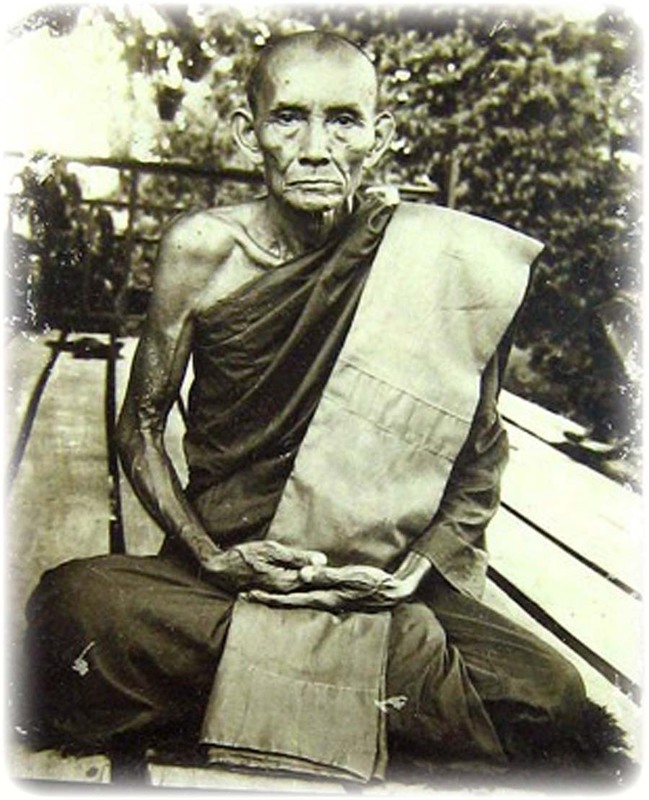 Luang Por Guay was also a very famous Sak Yant Tattoo Master renowned for Kong Grapan Chadtri and Klaew Klaad powers.